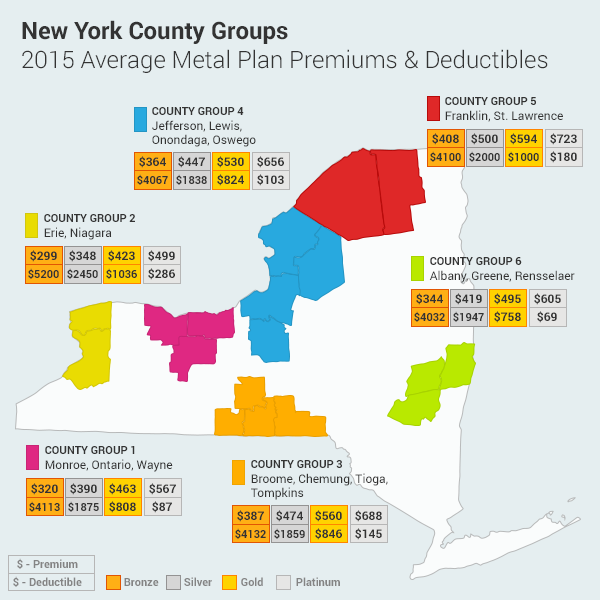 The average premiums for different levels of health insurance can vary widely depending on which New York County you live in, according to research prepared for WXXI's Understanding The Affordable Care Act reporting project. Here is an updated comparison showing the 2015 Average Metal Plan Premiums and Deductibles, and a slide showing the 2014 figures. Group One (PINK color code) groups Monroe, Ontario and Wayne county plans to give the average. Different level plans are represented by different 'metal levels' with Platinum representing the highest level of coverage. For the purposes of this comparison, New York counties were grouped around major upstate population areas to reflect density. Each row in the attached spreadsheet lists average premium, deductible, and MOOP (i.e. Maximum Out-Of-Pocket expenditures for covered medical services within a calendar year) for every county zone and every metal level. New York is the only state to my knowledge that bans age rating for individual health insurance premiums and uses a “community rating” for premiums*. Consequently, we used a single age profile for this market since it would not affect the results. The census profile for the quotes that underly the averages was an individual with a birthday on 1984-01-01. If the deductible was listed as "No Maximum", then we used the MOOP value as the deductible. If the deductible was listed as "Not Applicable", then I used $0 for the deductible. Other analysis by Kaiser Health News shows that care costs can vary widely within counties, something which the "community rating" of New York's system mitigates against. The healthcare.gov website has more on the factors that influence premiums. Below are the zip codes used to quote for each county zone. The attached spreadsheet also contains the same information for cross-reference.